Father's Day Gift Personalized Father's Day Picture Frame - - the most personal gift for Dad on Father's Day. Fast turnaround; ships in 1-2 days. Custom made just for your Dad. Two sizes: smaller red alder wood frame holds a vertical 4" x 6" photo. Larger frame holds a vertical 8" x 10" photo. The word "Dad" repeats in multiple fonts at the top and down the sides. Two lines of engraved personalization under the picture as shown above. Each line can hold up to 15 characters (including spaces). Includes easel back stand for table or shelf. Overall frame size: 6.5" x 8.5" or 11.5" x 13.5". 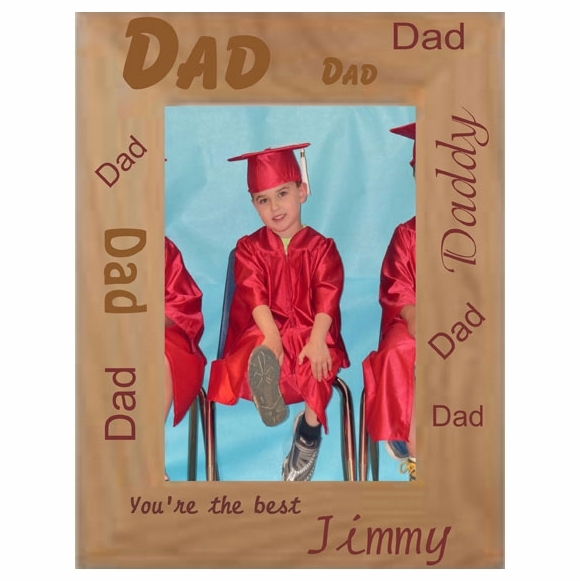 Our top Father's Day gift suggestion: a Personalized Father's Day picture frame. It's just about the most personal gift you can buy for Dad.